ECHO Center, Smokey Bear, and Woodsy Owl Promotion! 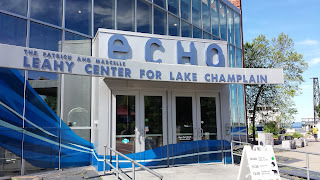 This year, the Vermont State Parks are teaming up with ECHO Lake Aquarium and Science Center to run a great promotion that entitles overnight campers to use their receipt in exchange for $4 admission to the ECHO Leahy Center for a group of up to four people! ECHO members are also eligible for free day-use parks passes to any of our awesome state parks, and the promotion runs until September 13. ECHO is currently featuring an awesome exhibit called “Home Sweet Home” with Smokey Bear, Woodsy Owl, and other furry critters to teach kids how to care for our planet, it’s natural resources, and about what is important to know when you head out into the woods. Kids have a chance to explore a Ranger Station, build bird houses, learn about native plants, and even get a mini forestry lesson. Vermont State Parks and the Vermont Fish & Wildlife Department are teaming up this season with an exciting new program that will encourage park visitors to take advantage of the diverse, easily accessible and family-friendly fishing opportunities that exist in most Vermont State Parks. "We're thrilled to partner with Vermont Fish & Wildlife to help make fishing more accessible to anglers at Vermont State Parks," said Craig Whipple, Director of State Parks. "There's a strong history of recreational angling at our state parks and we want to continue to bolster that tradition through the 'Reel Fun' program. Whether you want to fish from shore or take out one of our canoes, kayaks or paddleboats, we hope that you will make fishing at a state park a must-do activity this summer." As a park ranger, you see some unusual things. Take last Friday, for example...it was a beautiful, warm, sunny day at Niquette Bay State Park in Colchester. The sun was low in the afternoon sky and the sand on our south-facing Lake Sand Beach radiated warmth after baking all day under the sun’s rays. I didn’t see her right away, but, as I neared the prime spot on the beach, there she was…a lone park visitor, basking in the warm sun, with her toes buried in the sand. As I approached, I realized…..she was laying eggs! This wasn’t just any park visitor, it was a Northern Map Turtle. Map Turtles aren’t endangered in our state, but they are a species of special concern, which means they are ones that we want to keep an eye on. 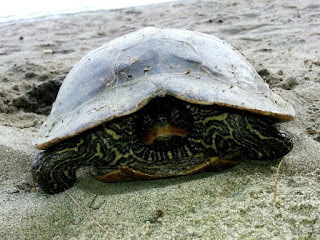 Map turtles are in a few lakes besides Lake Champlain, but Lake Champlain is the mother lode. Random Acts of Camping Coming to Vermont State Parks This Summer! MONTPELIER - Designed to share the joy of camping with Vermonters, the “Random Acts of Camping” program will be coming to a state park day use area near you. 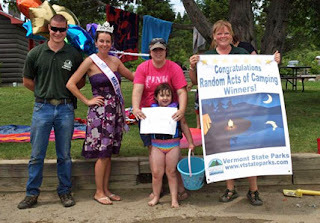 "Random Acts of Camping" rewards lucky park visitors with two free nights of tent, RV, lean-to, or cabin camping in any Vermont State Park campground. One winner will be chosen at random on nice weather weekends through August 3, beginning in Elmore State Park on June 27. The program was developed as a way to increase statewide accessibility to camping and to foster a lifelong love of the outdoors. Vermont State Parks will be giving away the free park stays to day users at Elmore, Silver Lake, Sand Bar, Alburgh Dunes and Kingsland Bay state parks during busy weekends this summer. The winners will be chosen at random by park staff. Winners will also receive personal trip planning assistance from the Parks Sales & Service Manager. Rise VT Hosts Smoothie Bike and Life-Sized Jenga in the Parks! 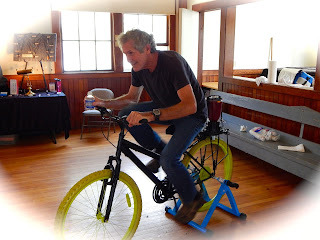 Visiting the Vermont State Parks just got a whole lot more delicious...as part of a Vermont-wide initiative to promote healthy living, RiseVT will be visiting the Vermont State Parks several times over the course of the summer with a smoothie bike and a set of life-sized jenga pieces! Families and individuals are one of RiseVT key target groups, so they’ve decided to bring their message to the parks with some nutritious mixes and stress-less fun. Introducing the New Trail Finder Website - Finding a Hike Has Never Been Easier! We all have those afternoons and weekends where we want to go out and get into the woods, but we don’t feel like hiking our usual spots and aren’t sure where to head. Lucky for you, the Vermont Department of Forests, Parks, and Recreation has teamed up with the Upper Valley Trails Alliance (UVTA) and the Vermont Geographic Information Systems (GIS) Community to help you solve that problem! 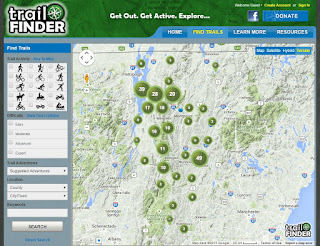 We are very proud to announce our new Trail Finder website, just in time for National Trails Day on June 6th.